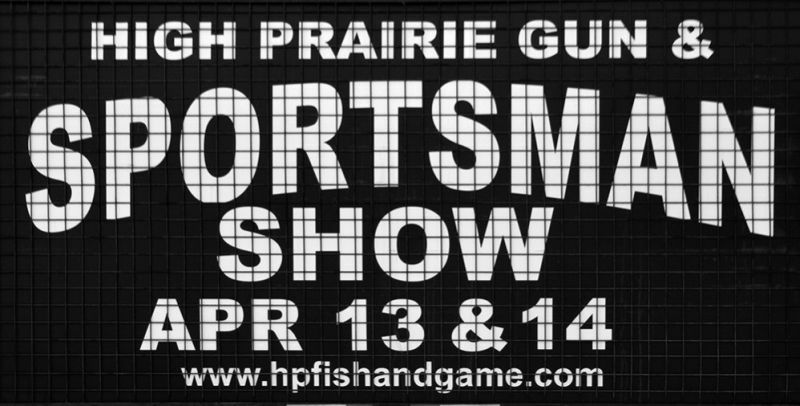 A sign promotes the popular High Prairie Gun and Sportsman Show that returns April 13-14. Spring is in the air and time again for the annual High Prairie Gun and Sports Sportsman Show April 13-14. The High Prairie Fish and Game Association hosts the event at the Sports Palace, Gordon Buchanan Recreation Centre and curling rink. “It features outdoor activities that interest people in the region,” Basarab says. Every year, the show has about a 20 per cent turnover in exhibitors, he says. “So there’s always something new to see,” Basarab says. -First prize – a Remington Versa Max 12-gauge shotgun with black synthetic stock. -Second prize – a Henry Big Boy .357 magnum rifle. -Third prize – a Ruger 10/22 .22 LR takedown rifle. Organizers welcome more volunteers for the event. “We’d never be able hold the event without several hundred volunteers, including youth and local organizations,” Basarab says. He says the event has one challenge. The 42nd annual Dawson Creek Gun and Sportsman Show will be held the same weekend. To volunteer, phone Rob Pardell in High Prairie at  523-6527. For more information, phone Basarab at  507-0051 or Leo Forseille at  523-1550.